NAMM 2014: Michael Kelly has unveiled three new models inspired by classic shapes from the '50s. The new 1950's series takes the looks and style of the electric guitars of that decade (we're guessing one in particular) and all retail for under $1000. For more information visit the official Michael Kelly website. Michael Kelly Guitars announces the new 1950's Series line of single cut guitars. The new body shape will debut this January at NAMM and will be available in five distinct models. 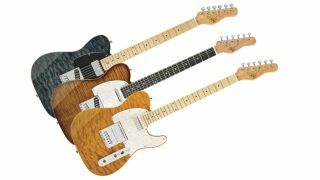 Following their unique "Boutique Within Reach" approach of producing instruments, Michael Kelly Guitars builds with the features, fit, finish and playability of those respected high end, low quantity builders but at key price points critical to a dealer's success and obtainable to the masses. The electric guitar dramatically changed the world of popular music during the 50's and this new line pays tribute. The 1950's Series offers features and sonic capabilities of those memorable sounds but with modern day appointments and production techniques. All five models feature an exotic wood top and contoured arm cut, master volume and master tone controls, a three way pickup selector, and coil taps for sonic range and versatility. The highlight of the series is the 1955. Besides being one of the first guitars under $1000 to have real flamed maple body binding, the guitar offers the unique pickup configuration with a Rockfield humbucker in the bridge and mini humbucker in the neck position. The swamp ash body with quilted maple top includes a white pickguard and chrome hardware. The maple neck features a six inline headstock and a compound 10.5" to 16.5" radius. Black wash and amber translucent finishes come with a maple fretboard and the caramel burst finish comes with a rosewood fretboard. The 1952 is a basswood body with flamed maple top outfitted with dual humbuckers, chrome hardware, white body binding and no pickguard. The maple neck features a six inline headstock and 12" radius, maple fretboard. Available finishes are deep cherry red and natural gloss. The 1953 is an alder body with flamed maple top outfitted with a stacked single coil pickup in the bridge and a tele-style pickup in the neck position, chrome hardware, alder body binding and a white pearl pickguard. The maple neck features a six inline headstock and 10.5" radius. The caramel burst and black vapor finishes come with a rosewood fretboard while the blue jean wash finish comes with a maple fretboard. The flagship is the 1957. This guitar is also one of the first under $1000 to have real flamed maple body binding. The swamp ash body is topped with a quilted maple top, chrome hardware and a white pearl pickguard housing a Seymour Duncan Little '59 in the bridge and a Rockfield humbucker in the neck position. The maple neck features a six inline headstock, a 10.5" radius and maple fretboard. Available finishes are black wash and amber translucent.